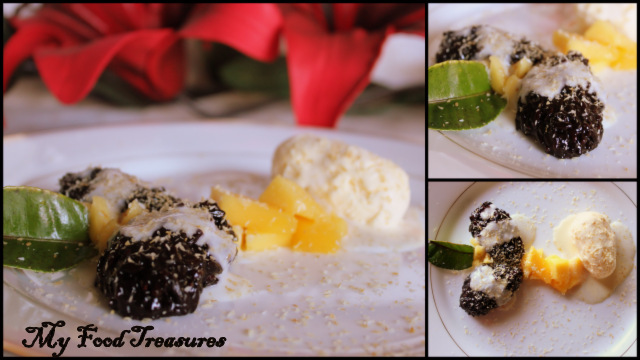 This Black Sticky Rice pudding comes from Thailand, the land of smiles. Black rice is a glutinous sticky rice is naturally sweet and nutty and has a dark purple colour to it. It has fibre and lots of antioxidants which makes this a healthy dessert. The rice has a bite to it, even after hours of cooking and when paired with coconut milk, toasted coconut, fresh fruit and ice-cream makes a complete nutty dessert with lots of freshness to it. For the people in Kerala, it will surely remind you of the Aravana Payasam. Okra Thai/ Malaysian Restaurant at Camberwell, Victoria introduced me to this delicious dessert. The recipe here is a recreation of Chef Micheal Tiu's dessert as explained to me by the owner of the restaurant. The difference is in the style of his presentation and his use of coconut milk ice-cream which I didn't make and couldn't find at any shops here. 1. Soak black rice in water over night. Drain and rinse twice. Place soaked and drained rice and salt with 1 and 1/4 cup of water in a pressure cooker. Place over high heat and bring to boil. Close cooker and pressure cook over low flame until rice is well done. This may take around 7-8 whistles. The rice will look mushy but will still have a bite to it. Check rice after removing pressure cooker from flame and the pressure reduces. If it is not done, add more water if required and continue to cook. 2. When rice is done, add sugar and 3 - 4 tbsp coconut milk, mix well and bring to boil over medium flame. Reduce flame to low and add corn starch dissolved in cold water to rice and mix well. Continue stirring until rice mixture thickens. Remove from heat. Rice is ready at this stage. You can cook rice to this step and keep aside to serve for later. Remember to heat rice over flame or in a micro-wave just before serving. Rice should be piping hot. 3. 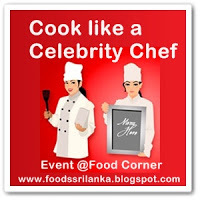 To make coconut sauce, dissolve corn starch in coconut milk. Heat over low flame, stirring continuously until coconut milk thickens to a creamy consistency. Make sure that lumps do not form. 4. Toast dessicated coconut until it becomes light brown in colour. 5. To serve, spoon black rice over plates. Add mango pieces and a scoop of vanilla ice-cream. Pour coconut sauce liberally over the black rice, ice-cream and mango pieces. Sprinkle toasted coconut. Yummy rice pudding, hv to try soon!!! Pudding looks rich and colourfull.love the pics.Happy to follow u. This looks so delicious. seems like you are an expert in sticky puddings. Healthy and yummy dessert.Thanks for your lovely comment on my page.Happy to follow your blog. wow.yummy dessert with fibrous rice. haven't tried this before..Tempting dessert dear!! I ca give you my UPS acct info. parcel me this one pl. whole dish looks so delicious. i bet when i finish this , no need of dishwasher. LOL. Tempting rice pudding, very impressive! Looks fabulous! Very tempting and innovative recipe. Reading it for the first time. wow! !this is a healthy dessert...looks very delicious..